one are the days when merchant seafarers had to buy and carry prepaid cards with which to call their families via the ship’s satellite phone. With more and more vessels allowing crews to connect to the internet via Wi-Fi, a good part of life at sea has changed. Video-chat and voice-call service Skype has revolutionised the way in which seafarers with access to broadband communicate with their friends and families. Those without the luxury of broadband can still access social networking sites – such as Facebook, Twitter, Friendster and Instagram – in the same way as their land-based counterparts. 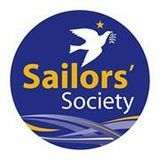 Facebook, for example, allows seafarers access to the posts, updates and photographs of their loved ones, and gives them the opportunity to communicate their news as well. Being able to communicate in such a free and spontaneous fashion brings many advantages, but there is always the need to stop and reflect before posting an update or photograph. Caution is required because, unfortunately, there are people out there who scour the internet for information that will allow them to commit a crime or facilitate a scam – or even stage a kidnapping. 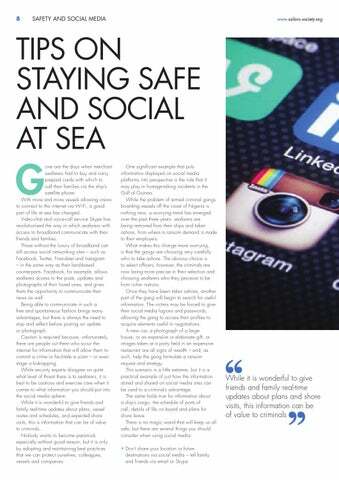 While security experts disagree on quite what level of threat there is to seafarers, it is best to be cautious and exercise care when it comes to what information you should put into the social media sphere. While it is wonderful to give friends and family real-time updates about plans, vessel routes and schedules, and expected shore visits, this is information that can be of value to criminals. Nobody wants to become paranoid, especially without good reason, but it is only by adopting and maintaining best practices that we can protect ourselves, colleagues, vessels and companies. The latest edition of Sailors' Society's Chart and Compass magazine. This edition focuses on innovation.